This post refers to HoudahSpot 3. The same general ideas still apply. HoudahSpot 4 does not differentiate “live templates” and “ready templates”. For more info on using templates in HoudahSpot 4 , see “Save Queries for Recurring Searches“. 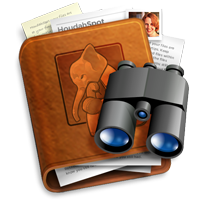 HoudahSpot searches can be saved as documents. These persist all aspects of your customized search: query, locations, columns, sort order, etc. Templates are HoudahSpot documents that serve as blueprints for creating new searches. You can create a new template using the Save As Template… menu item. To use a template, select it from the Templates menu. When saving a search, HoudahSpot remembers whether it was running (showing results) or not. We can thus distinguish two types of templates. These are templates that were saved while the search was active. A live template immediately starts showing results. Use live templates to get quick access to a collection of files. E.g. the sample template Applications lists all applications found on local drives. HoudahSpot will only open one copy of a live template. Hold down the option key and select the template from the menu to create an new window from the template. These are templates that were saved while the search was stopped. These serve as starting points for frequently performed searches. HoudahSpot includes an Email template. This is set up with criteria for searching Apple Mail.app messages: Authors, Recipients, Subject, etc. You just need to fill in the criteria you want to use and start the search. To use HoudahSpot to search for image files, set up a template with the relevant criteria and columns: Content Kind, Pixel Count, Resolution, Color Space, etc. You may also want this template to default grid / icon view. In HoudahSpot it is also easy to customize what new / blank searches look like. Set one of your templates to be the Preferred Template in HoudahSpot > Preferences > New Search.